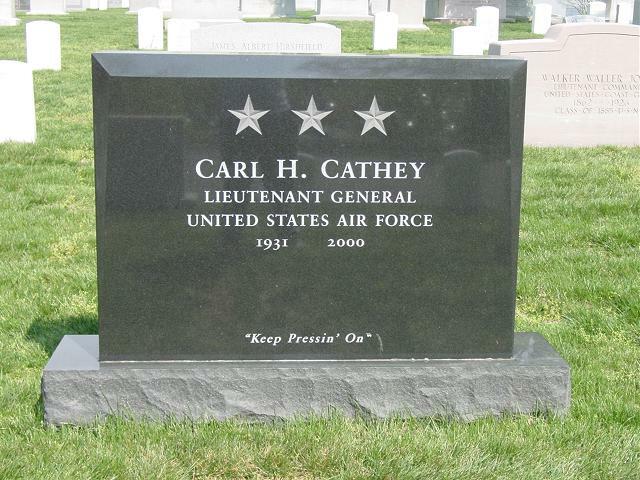 Carl Homer Cathey, 69, a Lieutenant General who retired in 1986 as vice commander in chief of the U.S. Air Forces in Europe and then was a defense consultant, died of a heart attack November 12, 2000 at his home in Annandale, Virginia. In the Washington area, General Cathey was vice president of the information systems group of Science Applications International Corp. (SAIC), a senior consultant for Burdeshaw Associates and vice president of Loral Corp. He helped establish Loral's office in Riyadh, Saudi Arabia. General Cathey was a native of Statesville, North Carolina, and a 1955 graduate of the U.S. Military Academy at West Point. He received a master's degree in astronautics and aeronautics from the Massachusetts Institute of Technology and was a graduate of the Army War College. General Cathey served in the Vietnam War. He was director of reconnaissance and electronic warfare in the office of the deputy chief of staff for research and development, deputy chief of staff at tactical air command headquarters at Langley Air Force Base and commander of the Third Air Force in England. His honors included the Distinguished Service Medal, four Legions of Merit, two Distinguished Flying Crosses, a Bronze Star, 10 Air Medals, the Joint Services Commendation Medal and two Air Force Commendation Medals. He was a member of the Order of the Daedalians and the National Sojourners. Survivors include his wife of 45 years, Marcia Maclachlan Cathey, and two daughters, Kim Kloster and Teri Pearson, all of Annandale; a son, Michael Cathey of Houston; a brother, Marc Cathey of Silver Spring; and four grandchildren. On Sunday, November 12, 2000 at INOVA Fairfax Hospital; beloved husband of Marcia M. Cathey; loving father of Kim Kloster, Michael Cathey and Teri Pearson; brother of Dr. Marc Cathey; grandfather to Stephanie and Jon Pearson, Kelly and Bryan Kloster. A full military honors service will be held on Wednesday, November 29 at 9 a.m. at Memorial Chapel. Interment to follow at Arlington National Cemetery. Memorial contributions may be made to the American Heart Association, 7203 Poplar St., Annandale, VA 22003 or the charity of your choice. Lieutenant General Carl H. Cathey was vice commander in chief, U.S. Air Forces in Europe, with headquarters at Ramstein Air Base, Germany. General Cathey was born in Statesville, North Carolina, in 1931. His childhood was spent in Davidson, North Carolina, where he graduated from Davidson High School in 1949 and attended Davidson (N.C.) College. He later entered the U.S. Military Academy at West Point, N.Y., and graduated in 1955 with a bachelor of science degree and a commission in the U.S. Air Force. He received a master's degree in astronautics and aeronautics from the Massachusetts Institute of Technology, Cambridge, in 1965 and graduated from the Army War College, Carlisle Barracks, Pennsylvania, in 1970. In August 1950, during the Korean War, General Cathey was called to active duty while serving as a private first class with the North Carolina Army National Guard. He was a member of the 378th Combat Engineer Battalion at Fort Lewis, Wash., when he received an appointment to the U.S. Military Academy. Following graduation in 1955, he attended pilot training at Graham Air Force Base, Florida, and Greenville Air Force Base, Mississippi. Upon completion of advanced fighter training in F-86s at Williams Air Force Base, Ariz., he began a three-year assignment in the Tactical Air Command at Myrtle Beach Air Force Base, South Carolina. He served as maintenance officer with the 355th Tactical Fighter Squadron flying F-100 Super Sabres. He also served on temporary tours of duty in Adana, Turkey, during the Lebanon crisis in 1958 and alert duty at Aviano Air Base, Italy, in 1959. In 1960 General Cathey was assigned to the 8th Tactical Fighter Wing, Itazuke Air Base, Japan. During this assignment he attended the U.S. Air Force Fighter Weapons School at Nellis Air Force Base, Nevada, and later transferred from duty as flight commander in the 35th Tactical Fighter Squadron to become the wing weapons officer. 497th Tactical Fighter Squadron "Night Owls." He flew 151 combat missions including 45 over North Vietnam. April 1971 he became deputy assistant for sensor matters in the Office of the Deputy Chief of Staff for Plans and Operations. August 1974 he became the first U.S. Air Force staff officer assigned to this new North Atlantic Treaty Organization headquarters when he was named assistant chief of staff for offensive operations. In July 1982 the general was assigned as commander of 3rd Air Force at Royal Air Force Station Mildenhall, England. General Cathey assumed his present duties in June 1983. Bronze Star Medal, Air Medal with nine oak leaf clusters, Joint Service Commendation Medal, Air Force Commendation Medal with oak leaf cluster, Combat Readiness Medal with oak leaf cluster and "La Cruz de la Clase del Merito Aeronautico con Distinctivo Blanco" presented by the Spanish air force in April 1974. He was promoted to lieutenant general July 1, 1983, with same date of rank.